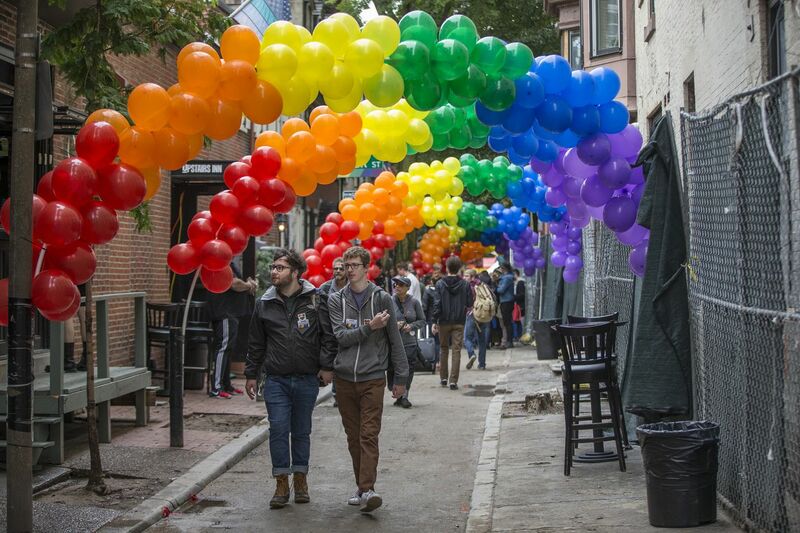 Rainbow balloon arches decorate Camac street at 2016’s Outfest. The largest celebration of National Coming Out Day in the world, Outfest draws throngs to the Gayborhood for one of its most spirited celebrations. Look forward to drag shows, high-heel races, dancing, and more. Swedish songwriter Li is stopping in Philly to perform her blend of electronic and indie at Union Transfer. Hip-hop duo TiRon & Ayomari open. College students get unlimited access to Philadelphia Orchestra concerts the entire season for $25 through the orchestra's eZseatU program, which kicks off with this concert led by Kensho Watanabe of Verdi's "Overture" to La forza del destino, the first movement of Dvořák's Cello Concerto, and the Suite from Stravinsky's The Firebird. The concert is free and includes a post-concert party at the Kimmel plaza. Swearin' is the terrific West Philly band co-fronted by Allison Crutchfield and Kyle Gilbride. The band broke up when Crutchfield released her 2017 solo album, Tourist in This Town, and is now back together with a new lineup that features bassist Amanda Bartley. Crutchfield now lives in Los Angeles, and the bicoastal band has a new album out this weekend, Fall into the Sun. Kenneth MacMillan created his Romeo & Juliet in 1964 after seeing John Cranko's version. Similarly, the Pennsylvania Ballet will be replacing the Cranko version it has danced many times with the MacMillan version, which artistic director Angel Corella performed with the American Ballet Theatre. Ship reconstructions displayed amid whiz-bang multimedia environments, more than 600 artifacts from Denmark, augmented reality, a "ghost ship" — all brought together to convey the reality of the Viking Age a millennium ago. A full-scale replica of a Viking ship will hang overhead in the Franklin Institute atrium lobby for “Vikings: Beyond the Legend,” opening Oct. 13. Celebrating the opening of Cherry Street Pier, the newest Delaware River waterfront attraction, this two-week-plus festival features interactive art installations and creative festivities. Expect tattoo art, comics, internet culture, and more. Lynn Nottage's study of Reading steelworkers and the decline of the industry and town in which they work.